Material Selection Assistance Service |Precision Machining of Ceramics, Quartz, Tungsten & Molybdenum | Top Seiko Co,. Ltd.
Top Seiko offers material selection assistance service by recommending materials based on material property important for your application. Since we do not produce materials, you can count on our unbiased material knowledge to choose the most suitable material for your application. We offer not only materials from Japanese manufacturers but also from those outside Japan. We also have a wide variety of materials in stock for quick delivery. You can take advantage of our comprehensive precision machining service including material selection assistance & material sourcing for your product development projects! Moreover, there are many successful cases of material replacements which resulted in improving quality, prolonging service life, and increasing productivity / product yield. Let us help you, too! High Temperature Resistance ・The part used under high temperature environment requires frequent replacement due to its short service life, resulting in high cost and downtime. Low Thermal Expansion ・Due to its low dimensional stability, the part expands at high temperatures, causing problems in dimensional accuracy and repeatability of the final products it produces. High Thermal Conductivity ・A material with high thermal conductivity is required for use in fast heat removal & high temperature applications. Low Thermal Conductivity ・The part operated at high temperatures loses heat too quickly because of its thermal conductivity. This heat loss by conduction causes variations in quality of the products. Scratch Resistance ・Rapid wear causes a part to lose its dimensional accuracy, resulting in frequent replacement of the part. 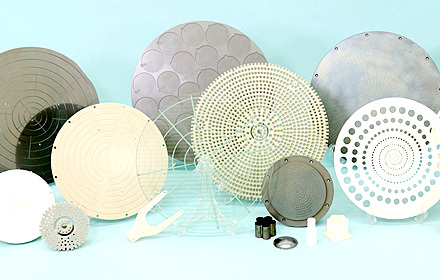 Resistance to Chipping, Cracking and Breaking ・Alumina is a popular material for precision machined parts. However, it is brittle and susceptible to breaking, chipping or cracking due to impact. Cost ・Cost reduction of ceramic parts with fine features and complex shapes is needed. We are pleasure to help your R&D with our high precision machining technology and our material suggestion for ultra-hard materials.